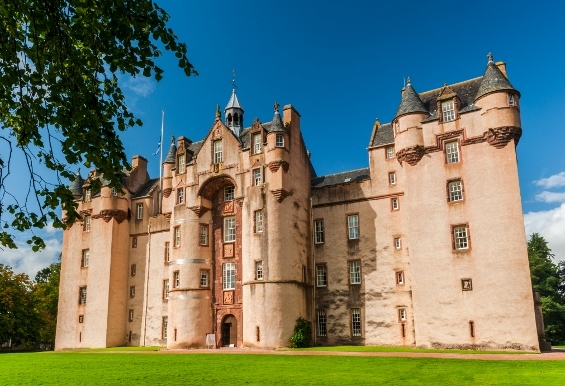 Pretty in pink, and a magnificent four stories high, Scotland’s Fyvie Castle is fit for a fairytale. Curious what’s inside? See here for a behind-the-scenes tour, and imagine yourself living like royalty in a fairytale fortress of your own! Follow along and we’ll show you how build your own castle, lights and all! Step 1: Using a pair of scissors, start by cutting around the outline of your castle. You’ll want to be sure that your starting and stopping points are around the same height on either side of your picture. When you’re done, you should have a level cutout like this. Step 2: Next, lay your picture face-forward and flat on the table. Then use a thin piece of double-sided tape to line the edge of one of one of the walls. Step 3: Carefully wrap the image into a cylinder, until the two walls overlap. Then stick them together, pressing along the top to secure the edges in place. Step 4: Add your battery-operated tealight and give it a glow! And there you have it, the castle of your dreams! Prop it on a windowsill for decorative flair, or use it as a fun nightlight to keep bedtime jitters at bay. Whatever you decide (maybe you have creative plans of your own! ), share your fabulous creations with us on Instagram and Facebook!